Holy One, of manger born whose birth we await, touch my mouth and all of our hearts, so that the words about to be spoken and the words about to be heard might be some portion of your Incarnate Word. Amen. This is a very difficult time. And people cheered… and it looks like he’ll win the Senate seat. There is a lot of evidence to suggest that life under Roman occupation was similarly traumatic. People forced into fighting and dying for the Roman army, taxes collected through violence that left many practically starving, daily abuse and sexual violence by Roman soldiers with no recourse, to name but a few. It is into this difficult time, that the Angel Gabriel reveals himself to the young woman, Mary. And it is about this difficult time and God’s actions in response to it, that Mary sings her song. I don’t know about you but this Magnificat always catches me by surprise, I think because so many try to tamp down and muffle Mary. She’s been so clad in baby blue cloth over the years that she’s been pacified beyond recognition. She’s been dis-empowered and made out to be meek and mild. But this portrayal is Empire’s attempt to pacify her and it’s wrong. Mary sings like the prophet she is and echoes Hannah’s song in the Hebrew scriptures. Theirs is a radical announcement of a re-ordering, of a massive disruption, of a communal turning. And her song is a prophetic critique of power in the ways that all the Hebrew prophets employ. It names power with precision and specificity. She names that the way the tyrants, the occupiers, the dictators use power—both interpersonally and systemically– stands condemned. Mary is clear the way all the prophets are clear: any context or process by which one group of people employ power and resources to subjugate, oppress, marginalize, and/or kill; any economic, religious, political, cultural, or relational system of power that is infused with an ethic of power-over, violence, extraction for profit, scarcity, use and a subject-object perspective… any of this will be disrupted, transformed, turned on its head. The Magnificat is about power. It is about the mis-use and a-buse of power. And it is about God’s transformation and redistribution of power. I have to admit that, given our context, I read Mary’s song and I have vengeance in my heart and on my lips. I am so worked up, angered by watching those I love be targeted and intentionally triggered, I want to perpetrate violence. I want to see the [insert expletive] get their comeuppance. And I believe and trust that God can handle my totally understandable rage. But I also believe that Advent, and the reality that Mary’s song portrays, isn’t about my bloodthirst, even as it does speak to our difficult time. The central message of the gospel is a call to vulnerability, authenticity, openness and solidarity. The God of the manger takes power very, very seriously but claims the vulnerability of a newborn as more powerful than the oppression of Empire. The God whose birth is foretold by homeless, outdoor laborer shepherds, understands that the authenticity of truth spoken to power-over is the real power. The God whose Incarnation happened not in the King’s palace, or the Trump Tower of Jerusalem, but in a barn in a backwater, bread-making town embodies the reality that true power is collective and liberative and life-giving. the manger and the cross of Jesus Christ. Who among us will celebrate Christmas right? “The Lord has regarded my low estate. Now, I have to tell you that all of this theology has challenged me and my bloodthirsty- it’s-about-time-for-a win and a comeuppance. But it has not yet spoken to my heart, nor to Maggie’s despair. It is a very difficult time. And so I turned to my community to ask through Facebook, how do you cling to the God of the manger and the cross? 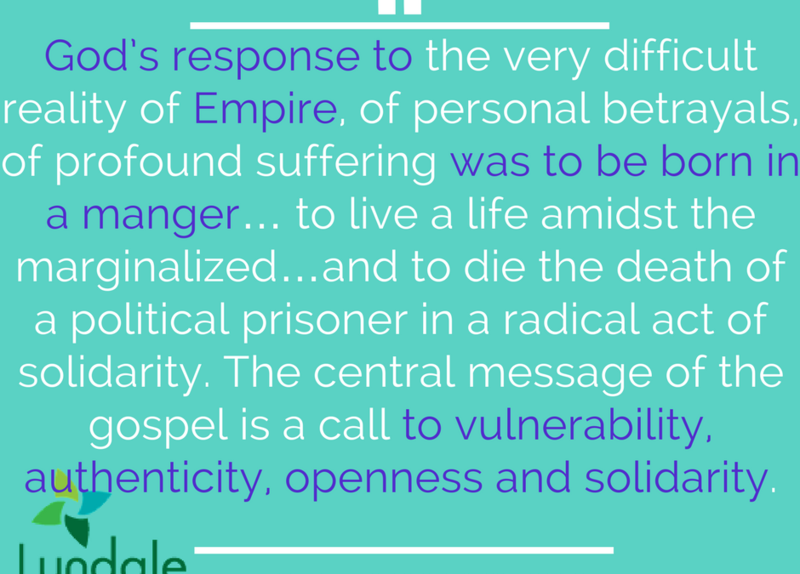 How do you hold fast to the power of vulnerability in the face of Empire? “You know that the Center For Popular Democracy has been bringing down citizens to testify in the halls of the congressional buildings, right? To risk arrest testifying on their own behalves, people in wheelchairs, those with terminally ill children, with pre-existing conditions — who will lose healthcare options altogether if the tax bill goes through and Medicaid is destroyed. One white lesbian woman reminded me of the people dressed in angel costumes, with huge wings who shielded the group of Fred Phelps protestors and their hatred, so that people attending Matthew Shepard’s funeral wouldn’t see or hear their vile. When we showed up, the judge and DA wanted to know who we were and why we were there. Immediately the judge called the attorneys into his chambers and a few minutes later emerged to say the case was dismissed. But that is not the part of the story that has led me to tell it. It was the guy’s attorney, also privy to this process, who came up to us afterward and asked to talk with us at his office nearby. We agreed. A few minutes later we were absolutely astounded by the reason. In this very difficult time, may we take the risk to witness to and act with the One whose advent comes to us in a vulnerable child.